In the world of beginner guitars, it’s long felt as if the whole thing comes down to a Nirvana vs Pearl Jam-style face-off between Yamaha and Fender, but it simply ain’t so. While Fender’s Squier and Telecaster and Yamaha’s Pacifica both deservedly feature in our lists, there are plenty more where that came from, and we’ve devised a list of the best electric guitars for beginners to help you navigate the murky waters (or, if you’re into your blues, Muddy Waters). The mysterious sounding ‘pickup configuration’ is something to look out for as you navigate our list, as it’s the starting point for what dictates the sound of the guitar. Pickups are the usually pill-shaped piece of plastic or metal you’ll find underneath the strings on any electric guitar, and their job is to listen to, or ‘pick up’ on the strings being played, hence the name. On most entry-level electric guitars, you’ll find humbucker or single coil pickups, or a combination of the two, and while we may not have enough words to fully do it justice, you’ll generally find that single coil pickups tend to give off a bit more buzz, while humbuckers...well, literally buck the hum. Then there’s the exciting bit – the design. Make like Slash, Jimmy Page and Mark Knopfler and go for a curvy Les Paul; like Kurt Cobain with a Squier or Joe Strummer with a Telecaster. Much of our list depends on beloved classic shapes for that iconic feel, with a few alterations to internal electronics, bridge setups and the like to keep the cost down for those looking to make their first steps in guitar-playing. But when it comes to choosing your first guitar, that’s far from a compromise. All of our picks are highly-regarded and highly-reviewed in their price range, with many seasoned players finding themselves pleasantly surprised by the build quality and sounds they could convince out of these entry-level guitars, so what are you waiting for? Fender is an aspirational name for any beginner guitarist, but there are more inexpensive avenues to buy into it than you think. The China-made Modern Player series makes the iconic Fender Telecaster accessible for beginner players, and while the change of bridge setup means it’s far from a classic Tele, that won’t matter for those just starting out, because the range of sounds you can achieve, from gain-heavy old-school rock to jazz-ready open chords, is quite extraordinary. And ultimately, that’s what makes the Modern Player Telecaster our best guitar for beginners. Every inch the rock’n’roll icon, the Les Paul is one you’ll certainly know by sight, if not by name. 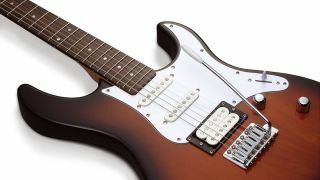 The single cutaway can make it a bit trickier to get to the highest notes at the top of the fretboard when compared with the double cutaway design of the Stratocaster, so it might not be the best practice guitar if you’re looking to bust out some face-melting solos, however it’s a much better bet for metal fans as the on-board humbucker pickups gives a bit more heft than the Strat’s single coils. It’s also a little on the heavy side, so smaller guitarists might want to hold off for a bit. But, if you’ve got the stamina for it, this is one gorgeous guitar. As an inexpensive beginner guitar, you might not expect much from the PAC112V, but you’d be wrong to write it off. With somewhat Strat-inspired looks and a lightweight but great-sounding alder body it’s a handsome and easy-to-handle first guitar, and the combination of humbucker and single coil pickups mean the range of tones you can achieve is great enough for considerable experimentation. While its looks are simple, the quality of the construction is superbly high, and it’s still the same price it was back in 1993 – both marks of a brand that remains faithful to the beginner market. The Squier Bullet Strat is a really solid all-rounder for beginner guitarists, modelling itself on the original Fender Stratocaster in shape, neck size and pickup configuration, but with a few concessions to keep the cost down for learner guitarists. The double cutaways (the giveaway being the two ‘spikes’ at the top of the body) make it easier to reach the highest frets than on some more closed-off designs, making solos and high-pitched riffs more accessible. Its three single coil pickups might not pack as much power as humbuckers, but it has a sound that’s all its own, and a really pleasant one at that. Aspiring blues players will love the vintage stylings of the Epiphone Dot, with its Gretsch-mimicking curvy shape, traditional f-holes and sunburst colourway. Players found it had a pleasingly rich sound, thanks to a combo of maple and mahogany in the build, the natural acoustics of the semi-hollow body, and dual humbucker pickups. If you’re after something a little different to the usual starter fare, this is an excellent value guitar with an authentic vintage look and sound to get started with, and then keep around for years to come. This high-spec beginner guitar runs just the right balance between looks, quality sound and affordability. Some players noted a lack of clarity and a slightly “muddy” sound, so while it might not be as suited to playing a multitude of styles like the jangly Telecaster or noodle-friendly Pacifica, reviewers found it ideal for early rock ‘n’ roll, classic rock and blues, all essential additions to the beginner player’s roster. Found to be somewhere between a Les Paul and an SG (another great beginner guitar) in terms of sound, if you want that classic design, but not the hefty price tag of a Gibson, this is a great first guitar. This Chapman guitar, with its delectable gloss coffee finish, might cut a dashing figure on the wall of your local guitar shop, but it’s really all about the little things here that add up to make this one great guitar for beginners. The rolled fretboard edges give the guitar a more broken-in feel (trust us, that is a good thing!) making it more comfortable to play and to hold if you’re unused to the action of holding down strings, while Chapman’s own single coil pickups open up possibilities for a huge range of tones. Whether for plugging into your amp to keep your practice on the down-low, or creating some tranquility in a house with someone playing Smoke on the Water for hours on end, you might want to take a look at our list of the best noise-cancelling headphones.